Which Darths And Droids Character Are You? Darths And Droids is a space opera within a soap opera. As we read it, we follow both the adventures of the Star Wars characters – often drastically reinterpreted in the comic strip – and the lives of the human gamers playing them. Which one are you? Are you an experienced gamer like Jim, Ben, and Pete, or new to all this, like Sally and Annie? Or someone much more at home playing with computers than with people, like Corey? Are you a good employee/student? Yes, I’m conscientious and it takes a lot to make me abandon a commitment – but if I do, it’ll be sudden and dramatic. Yes, though you wouldn’t guess it from the way I clown around outside working hours. Work hard, play like an amateur – it’s more fun that way! I’ll disobey orders rather than do anything that’s against my principles. Yes – I’m ambitious and competitive in both my job and my hobbies, and find that my skills transfer well between the two. I might have been late for work a few times. Well, most times. Except when I don’t show up at all. Well, so what? This job is only a stop-gap until I can follow my real dream! I don’t mind pulling a sickie if there’s something more important I need to do, like playing a game. What job would you rather have? What would people who know you well be most surprised to learn about you? That I can stand up to pressure from my family – sometimes. That I’m intelligent and well-educated, despite acting like an idiot most of the time. That I can make a major life decision, and stick with it for more than a week. That I have a job that involves wearing a suit. Or that I have a job. That despite coming from an arts background, I can learn enough science to keep up in a geek conversation. That I have a hobby that involves interacting with other people, not just with computers. If you’re not sure whether a character in a book or film is good or bad, how do you decide? I’m very suspicious of cheap grace – I have high moral standards, for myself and others. I check whether he has a goatee. I consider how he/she behaves towards minorities and animals. I don’t worry much about morality – but betraying your companions is definitely wrong. I’d rather watch how the character develops over the story, and what we learn of his/her motivations, instead of making snap judgments. I’m willing to give characters the benefit of the doubt, and look out for any sign of good qualities, however small. If you were in a play, would you be willing to play a villain? I’d rather not – but if I find out that my character is involved in anything nefarious, I’ll play the part consistently. I might be tempted, if it’s my last chance of getting a decent-sized role. I’m a nice person – but if I’m playing a creature that eats humans, the humans might not see it that way. What? I’m not evil – I just want to own an artifact that makes me the most powerful entity in the universe, so that everyone must bow before my innate superiority – why are you looking at me like that? Yes, if it’s a psychologically believable character. No, I want to be good, and help others find redemption. What sort of science fiction would you rather read? Well-researched hard-core SF, like Hal Clement. Anything with lots of action-packed adventure. Something with lots of cool aliens in it, like Sector General. An obscure comic from the 1950s, which I can quote to the bemusement of people who’ve never heard of it. Something with well-developed characters, like the Vorkosigan Saga. Something I can adapt into a computer game. If you were a character in a science fiction story, what would be your greatest weapon? A blaster – no, make that lots of blasters. And explosives! If you were a Hitch-Hiker’s Guide To The Galaxy character, who would you be? If you cloned yourself, what would happen? In theory – I could get work done efficiently, by sharing it with someone as logical and reliable as I am. In practice – I’d be stuck with the job of babysitting my clone-sib. The different versions of me would keep telling each other how cool we are. We’d all follow totally different careers. We’d have a fight, and the winner would be the new me. There would be complex familial conflicts between the clones. I wouldn’t! If someone ELSE cloned me, I’d find the whole idea really freaky, but I hope I’d overcome my prejudice eventually. If you were a Jedi knight, what would you do? Be a paladin defending justice, and teach others to do the same. Make more Jedis by transfusing my midi-chlorians into people. Have a rainbow-coloured laser sword. Have cool extra-sensory powers that more than compensate for my apparent disadvantages. Be evil, and destroy the Jedi order by convincing each of the councillors that the others are evil Sith lords who are out to get him. Find it really scary, but get the hang of it eventually. In a table-top role-playing game, how would your fellow players describe your playing style? I’m not sure – I mainly play computer games. Be a parody of something really silly, like superhero comics. Be the most epic adventure ever! Require players to play robot dinosaurs fighting for freedom against the humans who exploit them. Be a way to get revenge on anyone who’s annoyed me lately. Subvert people’s expectations about who is stereotypically good or evil. Feature big guns. And even bigger guns. 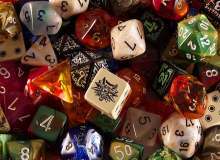 What sort of dice would you bring to a role-playing game? Isn’t the Game Master supposed to supply them? Quiz topic: Which Darths And Droids character am I?